An update on the hot bean paste situation. Last year I mentioned that Iris developed a taste for spicy foods and that, not coincidentally, I became addicted to Sichuanese hot bean paste (doubanjiang). You can also buy a smaller amount (300g), but I don’t see the point, because this stuff is worth using over and over. It’s not so much versatile as it is reliable, more Jack Nicholson than Meryl Streep. The first thing to know about this chile paste is that it comes in very entertaining packaging. It’s in a sturdy airtight plastic pouch wrapped in paper. It feels like you could use it as a big hacky sack (note to autocorrect: I really hope there’s no such thing as a “jacky sack”), and when you open the paper, it’s like Christmas morning. The paste itself is deeply rust-colored and extremely chunky, which brings us to the second thing you need to know. When you buy so-called Sichuanese chile bean paste in non-Sichuan-oriented stores—most stores in my area—you’ll usually be getting a product made in Hong Kong or Taiwan. It will usually contain soybeans in addition to or instead of fava beans, and it will be smooth-textured. The most common brand, Lee Kum Kee, can be found at some supermarkets. It’s not bad at all. It’s a lot better than no chile bean paste. But it’s not the same as the stuff made in Sichuan. I asked my friend Marc, who went to cooking school in Sichuan, about this, and he said that in his class, they chopped the paste with two cleavers until their hands were numb before cooking with it. I just emptied the whole plastic pouch into a food processor, blended it until fairly smooth, and kept it in a tub in the fridge, where it held fine for a year while I used it up. Ma po tofu. With the exception of what I ate at San Xi Lou in Hong Kong, I’ve never had a better ma po tofu than what I’ve been making at home from Andrea Nguyen’s recipe. I use silken tofu. Yes, it falls apart, delightfully. And, lest you think this stuff is only good with meat, probably my number-one favorite recipe of the year, Fuchsia Dunlop’s Fish-Fragrant Eggplant. I’ve never been a big eggplant fan and I hate deep-frying at home. This dish is so great that I now deep-fry eggplant once a week. Generally speaking, doubanjiang is made to flavor oil. You want to heat up some oil, cook the paste in the oil for a minute or two until the oil turns red, then use that oil to flavor the rest of the food. If you’re cooking ground meat, wait until it releases some fat, then add the bean paste and stir-fry until it all turns delectably red. An exception is that beef stew with tofu “bamboo,” sticks of dried tofu skin that drink up the spicy, savory broth. If you’re not familiar with tofu bamboo, maybe I’ll introduce it next time. Until then, have fun depleting that doubanjiang. This entry was posted in Uncategorized on November 9, 2013 by mamster. I spent the weekend in New York City on book tour. On Saturday afternoon I was joined in Brooklyn by Tim Anderson, author of the hilarious memoir Tune In Tokyo: The Gaijin Diaries, which was an inspiration for Pretty Good Number One. If you enjoyed my book and haven’t read Tim’s, get on it. Since New Yorkers love to hear about themselves, I tried to work plenty of Tokyo versus New York observations into my talk, with particular emphasis on food. Here are a couple. New York is a city of immigrants. Tokyo is not. The first-generation immigrant population of NYC is over 36%. In Tokyo, it’s 1%. In New York, you can find any kind of international food you want. In Tokyo, you can find any kind of Japanese food. Here’s something that isn’t so different: New York has plenty of Japanese restaurants and shops that would be solid contenders in Tokyo. Ippudo is a branch of a ramen chain that originated in Kyushu, Japan. Its specialty is tonkotsu ramen, thin noodles in a rich pork broth. I enjoyed the Akamaru Modern, a bowl of tonkotsu with a crimson red scoop of Ippudo’s miso blend, to be stirred into the soup before eating. A new location of Ippudo just opened in Hell’s Kitchen. Outside Ippudo is a Citibike station, offering heavy-duty blue bicycles for short trips around town. All you need to get a bike is a debit or credit card, and once you’ve paid for a day ($10), week ($25), or year ($100), you can take unlimited rides of 30 minutes or less. You’re not allowed to park the bike anywhere other than a Citibike station, of which there are many in Manhattan and northern Brooklyn. A one-day pass costs as much as four subway rides, and I didn’t get my money’s worth, but I loved zipping down First Avenue to my next destination. This was my first bike ride since 1998. I have no interest in owning a bike, but if bike sharing came to Seattle, I’d use it constantly. I rode the Citibike 2.2 miles from Ippudo to Ippodo, no relation. Ippodo is a Kyoto-based tea company with shops in Japan and a brand-new New York location. Mr. Kato, from Kyoto, manned the counter, which is in the lobby of Kajitsu, a well-regarded vegetarian Japanese restaurant recently reviewed in the New York Times. Kato-san and I talked about Japanese tea for a bit, and then he started brewing samples. Using a series of ceramic tokoname teapots, he had me try three types of sencha (brewed tea), one gyokuro (high quality shade-grown tea), and a matcha granita, churning in a slushee machine. From each pot, Kato-san poured us each a cup, took a sip of his own to ensure it had been brewed properly, and set it aside. I, meanwhile, drained each cup, and we continued to talk about tea, which more and more gesturing and broken Japanese on my part as I got fully caffeinated. My favorite was the Hōsen sencha, which has a bit of gyokuro flavor. If you like tea, think you might, or are looking for a gift for me, I can’t recommend Ippodo highly enough. The tea is reasonably priced for the quality level; the shop also sells very expensive tea ware and accessories. You can also get an inexpensive cup of tea to go. East 9th Street, in the East Village, is like Tokyo in miniature. Beginning on Stuyvesant Street, which turns into 9th, the street features an excellent small Japanese supermarket (Sunrise Market), a bakery that also serves Japanese breakfast (Panya), a yōshoku “Western food” restaurant (Village Yokocho), a grilled beef restaurant (Yakiniku West), a soba place (Soba-ya), a robata grill restaurant (Robata-ya), a teahouse (Cha-an), and the place I had lunch, Otafuku, a tiny stand-up counter serving takoyaki and okonomiyaki. Takoyaki are octopus balls—plump, gooey, spherical pancakes with a chunk of steamed octopus inside, cooked on a special griddle and served deadly hot, topped with sticky-sweet takoyaki sauce, Japanese mayo, fish flakes and seaweed. 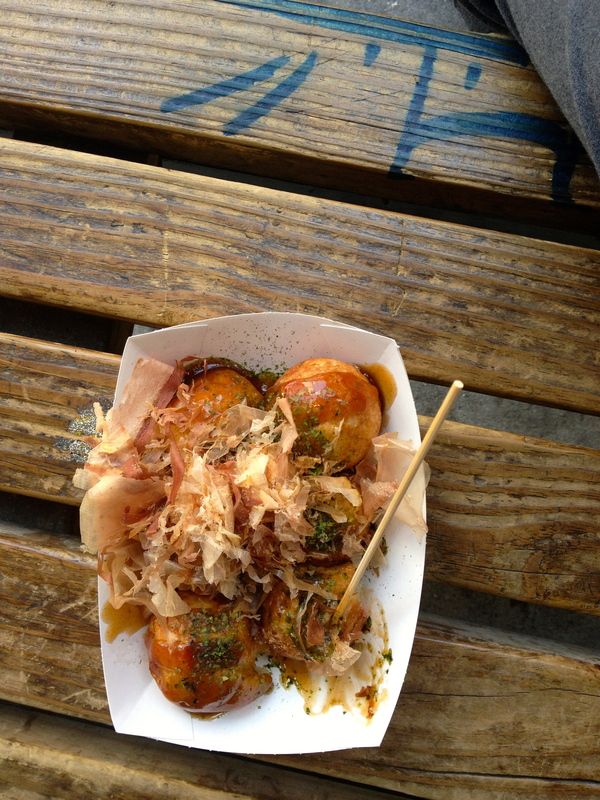 Otafuku’s are daily the best I’ve had outside Japan, although the ball was better than the perfunctory octopus bits. From Otafuku, I walked around the corner to Van Leeuwen artisan ice creamery for a scoop of intense black sesame. Ganso, in downtown Brooklyn, answers the question, “What happens when a successful cookbook author decides to open a restaurant?” Harris Salat is the coauthor of Japanese Hot Pots, Takashi’s Noodles, and the forthcoming Japanese Soul Cooking. Ganso puts theory into practice, serving ramen (including a well-conceived spicy vegetarian ramen) and tasty small plates like broiled mackerel, gyōza joined together with a crispy fringe, and sticky chicken wings in the style made famous at Pok Pok. Eataly is obviously not Japanese…but it sort of is. Mario Batali’s temple of all things Italian is huge and houses several restaurants, racks of pasta and olive oil and Italian beer and wine, and deli counters selling cheese, gelato, salumi, meat, and bread. Throw in some Japanese food and sink the place into the basement, and it would be a perfect recreation of a depachika, the lavish basement food hall found in every Japanese department store. At the bread counter I bought a square of excellent roasted red onion focaccia and had to force myself not to eat it all to save room for dinner. 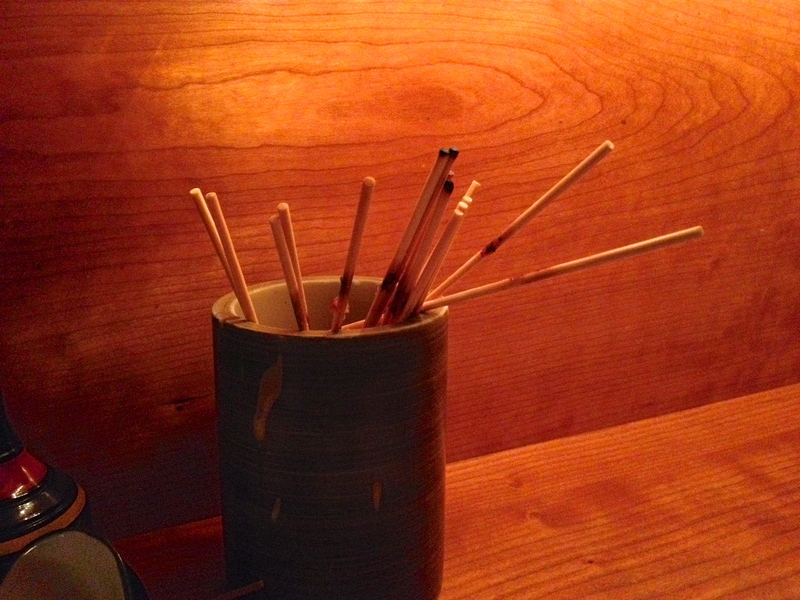 Yakitori Totto is simply a real Japanese yakitori experience. The cooks grill skewers of chicken, other meats, and vegetables over clean-burning charcoal. (Despite its cramped, second-floor location, Totto is oddly odorless; chalk it up to Japanese charcoal and a powerful vent fan.) If a chicken were a NYC subway map, Totto’s menu would visit every stop. Unfortunately, some of the most desirable bits (heart, cartilage, and tail) were sold out, but the momo (chicken thigh with onion), tsukune (chicken meatball with bits of soft cartilage), and shishito peppers were perfectly charred and seasoned. 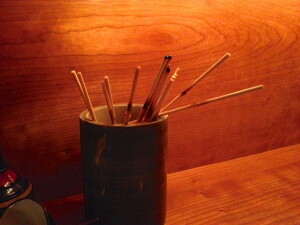 And Totto even has cups for discarding your empty skewers, just like in Japan. If I were to open a restaurant, which I definitely won’t, it would be a tempura place. You’d sit at the bar, and I would fry whatever you like to order: lotus root, onion, green beans, shrimp, fish, squash, and whatever is in season. Other than tempura, we wouldn’t serve anything other than cold drinks and maybe a plate of pickles. Every neighborhood in Tokyo has a restaurant like this, or several. I asked around, and there is no such place in NYC. Is there one anywhere in the US? Who’s going to open the first? This entry was posted in Uncategorized on July 16, 2013 by mamster. 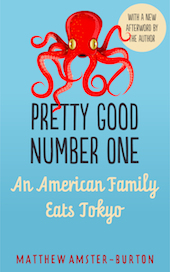 Pretty Good Number One is now out in paperback. You can buy it on Amazon or special-order it at any bookstore; they’ll have it for you within a couple of days for $13. 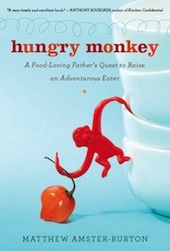 I have a Q&A this morning on the Seattle Times’s food blog. This Sunday (July 23), I’ll be reading, talking, and showing a few photos at Ada’s Technical Books, a lovely small bookstore on Capitol Hill, Seattle. This is the only date on my book tour where the paperback will be for sale, so come by and pick one up, and I’ll sign it for you. The paperback will also be in stock soon at Elliott Bay Book Company and University Bookstore in Seattle. Finally, if you’re in Boston and want to come to my event there on Monday, July 15, please send me an email (rootsandgrubs@gmail.com). It’s a private event, but anyone who reads the blog is welcome; just RSVP. Thank you again for being my most faithful readers. This entry was posted in Uncategorized on June 21, 2013 by mamster. Outside a public park one day, a cafe stand did a brisk business selling iced coffee and tea and cones of soy milk (tōnyu) soft cream. My friend Akira shared a bite with me, and as the smooth, earthy stuff melted on my tongue, I thought about the ignominious fate of soy milk in America. What I didn’t mention, because I couldn’t figure out how it fit into the book, is that this was also the site of my most absurd linguistic mishap of the whole trip. Lesson learned: the first rule of Japan is, don’t try to talk about Fight Club. This entry was posted in Uncategorized on April 27, 2013 by mamster.